You can almost taste the wholesomeness through the picture. 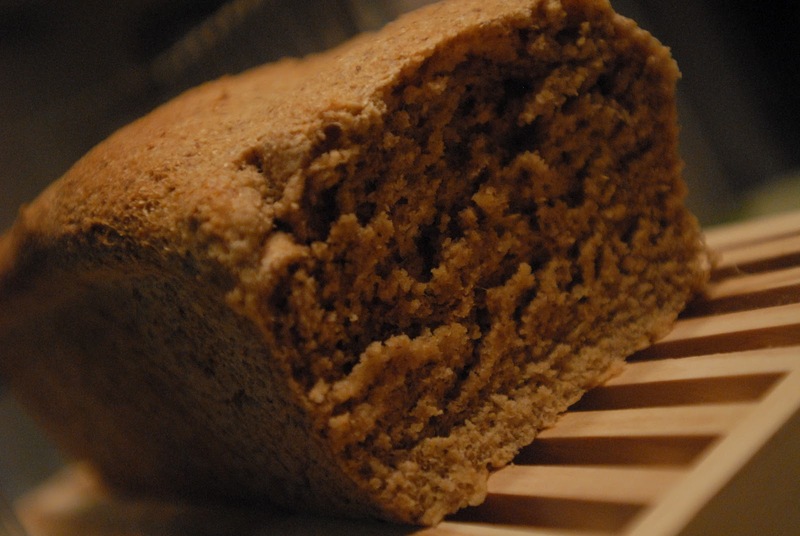 One slice of this bread has more vitamin E, fiber and antioxidants than you could imagine. You can use this bread for sandwhiches, toast, even bread pudding.What is even better is that you can use this basic dough recipe for pizza dough, bagels, pita, tortillas… even doughnuts! Coincidentally, it is very easy to make: from wheatberry to bread. Since this is one of my first posts and basic breads, I’ll go through the whole rigmarole of documenting my set up and many of the steps of this process. From left to right are my materials. On the far left back in the burlap bag is my hard red wheat berries, next is the whole flaxseeds, kitchenaid mixer, soft white wheat berries and my cuisinart automatic burr coffee grinder. I purchased the flax and both wheatberries from amazon. The other items you can get virtually anywhere. Here is a picture of my last 3 ingredients. You can find them at Whole Foods and usually any local grocery store. Lecithin is the bag of golden looking granules and it really makes the bread soft and the dough less sticky. Yeast, obviously allows the dough to rise and the gluten just makes sure the bread rises properly and makes the dough softer. I have the gluten in a glass jar and I keep both the gluten and the lecithin in the fridge (to extend its shelf life). OK, now we’re ready to mill the flour. I just fill the cuisinart coffee grinder reservoir to about one inch below the top. Then I simply put it on it’s finest grind setting and push “start.” Once I have ground all the flour, I add the whole flax seeds and grind those as well. The photo on the left is the freshly milled flour, the photo on the right is the freshly milled flax. Note: make sure you freeze any left over flour or flax as they will both go rancid. Then you take this and put it into your loaf pan (2Lbs). I mean just look at this texture!! You can literally SEE the whole grains. Ok, enough of that, just put the dough into your bread pan and let it rise again until the size of the dough doubles. Then just bake in the oven at 350 for 25-30 minutes. I got the basic dough recipe from The Bread Beckers INC Recipe Collection and tweaked it a bit to my liking. Tweaking recipes and BYOC (Being Your Own Chef, in the famous words of Clare Robinson, one of my favorite food network chefs) is my favorite thing about cooking and being in the kitchen! Looks positively delicious, and undoubtedly good for you. I bake a lot of bread; I'll have to try this some time. I am impressed! How do you manage all that you do? Wonder Woman is alive and living in Georgia. I will look for more on your blog.